Cristina Madeira » The customer relationship can be lost! The customer relationship can be lost! I have seen an amazing video of a customer holding an item in front of the robot, and then that robot actually leading the customer through the store to the exact location of the item. At first I thought, “How cool is this!” Then I started thinking about what was great – and not so great – about this new technology. What’s great about it is that it really is cool. It’s a novelty at this point. The robot is built and programmed for accuracy. I show or tell the robot what I want, and it leads me to the exact location of where that item is in the store. For the retailer, there is the benefit of efficiency. While the robots aren’t inexpensive, they aren’t as expensive as typical labor costs. Over time, the robots pay for themselves. Now, what’s not so great? To start with, it’s hard to create a bond with a robot. The relationship can be lost. 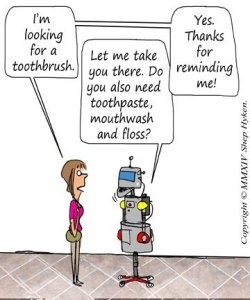 How can a robot make a customer feel appreciated? Smart retailers will recognize that the robot, at least for now, is an enhancement versus a replacement for a good employee forging a relationship with the customer. There is also the helpful factor. No doubt that showing a customer where to find their item is good, but what if the customer has questions about how to use the item? And, at least at this time, the robot most likely isn’t capable of making recommendations to up-sell or cross-sell at the appropriate times. So you probably think I’m against the robot. On the contrary, I’m excited about robots. This is just the first generation. Think about what’s to come. I anticipate that the concerns I’ve mentioned about the relationship and lost sales opportunities will be a moot point in the somewhat near future. Once the public accepts the concept of a machine helping them, the robot manufacturers and programmers will go to work to make sure they take this experience to the next level. So, here’s another crazy idea. Why do we even need robots? Don’t our mobile phones do just about everything? If a phone can give me directions, and lead me, step by step, to an address a mile away, surely an app can be built to help me find a hammer a couple of aisles over. This app can be programmed to monitor my shopping patterns and make appropriate suggestions about what else I should buy. And, the app allows the retailer to communicate with me during and after the shopping experience by offering special customized promotions and coupons. It might even send an email or text me a gift certificate for my next visit, thanking me for my loyalty. The robot is super cool. But, what’s in my pocket – my mobile phone – is super cool, too. When I started my business in the early 1980’s helping people deliver better customer service, I would never have dreamed that robots and mobile phones could actually enhance the customer experience. We live in some exciting and interesting times, and I’m looking forward to what lies ahead!